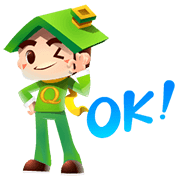 http://www.line-stickers.com/ – Mr. & Ms. Q Family of Q House Line Sticker | Mr. Q & Ms. Q are here to make your funny and playful chat with friends and family. Add friend Q House official account to get them. Mr. & Ms. Q are coming to fill your chats with fun and make them livelier than ever with their new LINE stickers! Friend Q House’s official account to get them. Available till March 30, 2016.